No castle is complete without a noble knightly crest! 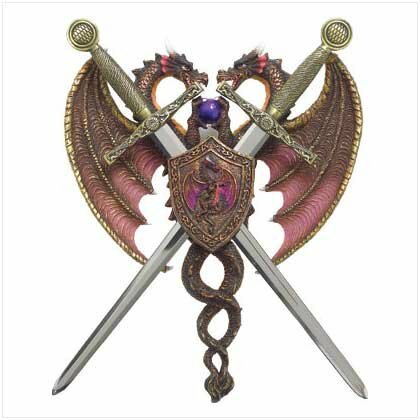 Two proud dragons, locked in battle, intertwine to form a curvy backdrop for two shining gold-hilted removable swords. Hang this prize with pride upon your door or wall! Polyresin with metal swords. Measures: 9" x 1 3/8" x 11" high overall; each sword is 3 1/2" x 1 1/2" x 14 1/8" long.